I got a bit obsessed yesterday with making variations of my poem, I Think in Ink, that I shared out as a looping Vine piece yesterday. I played around with some image apps and then, taking a cue from Terry, began to explore a site called Zeega, which is another media-combining site that is interesting to use. And here are two of the image renditions of the poem. The first one uses an app that is a poetry wordcloud generator. 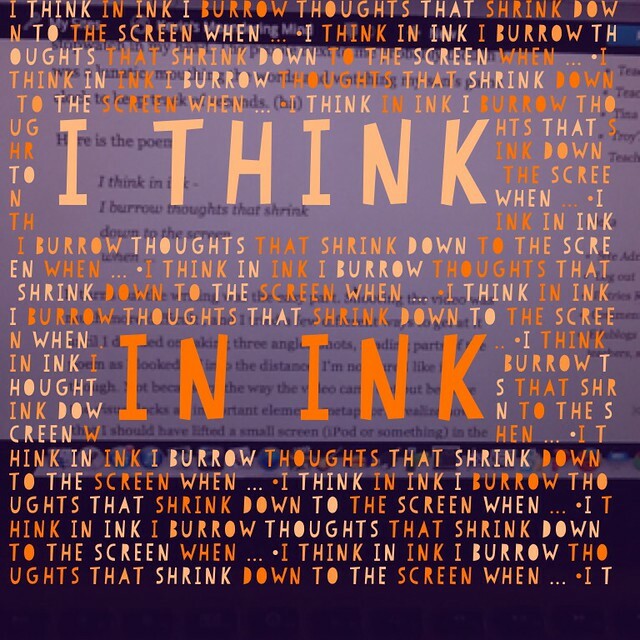 I noticed that you could import an image as your background, so I did, taking a shot of my computer screen with the original poem in the center focus point. 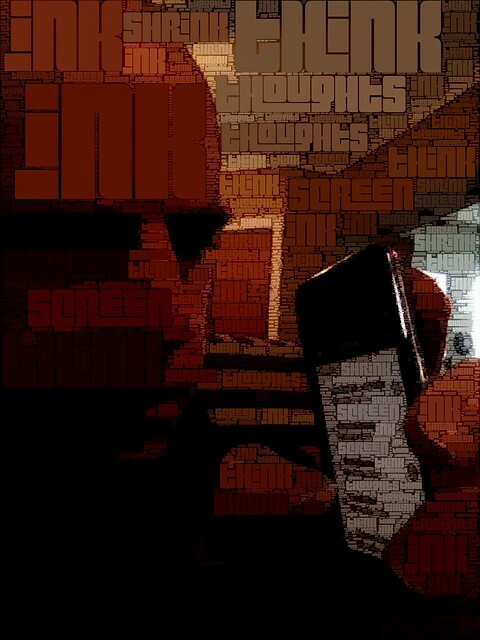 The second one uses an app that takes an image and reconfigures it as another kind of word cloud. I took a shot of me, holding an ipod, and then tinkered with the main words from the poem, and spent quite some time toying around the with settings to get the design that I wanted. PS — I have one more comic to run tomorrow. It’s not technically part of the series, and yet … it is. If you spend enough time reading articles or watching interviews with the folks behind the major sites in the Web’s history (most of which lines data ghost towns), you realize that one phrase keeps popping up in the mouths of the site leaders, and often, it spells the beginning of the end of the site. (Are you there, Friendster? AOL? Yahoo? MySpace? And will you survive, Facebook?) 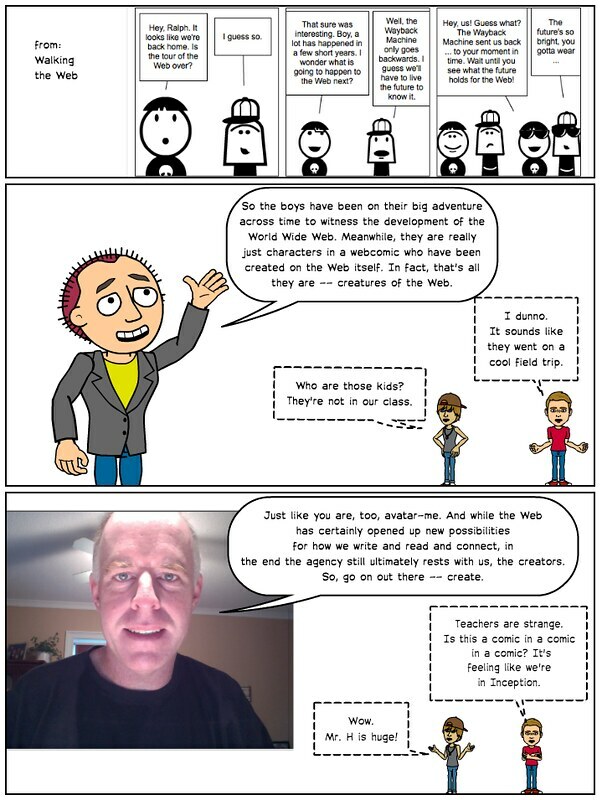 The boys in my comic — Walking the Web — notice it, too. I admire Bill Gates for his push into philanthropy (but not so much his push into education). The boys in my comic meet Gates right at the moment when Microsoft realized, a bit too late, that the Web was the place to be, not the desktop. Oh well. Before folks launch into me here, I know that Marc Andreessen has done other things since he and his partner, Eric Bina, created the Mosaic browser (which became the basis for Netscape). Ning is just one of Andreessen’s many ventures. But the boys in my comic, Walking the Web, only see his role in history as helping to develop and release Mosaic because, in historical terms, that is his one great achievement, and all done while still very young and living on pizza and cookies and milk (according to various bios).